A father desperate to secure a heart transplant for his ailing son takes an emergency room hostage until doctors acquiesce to his wishes. 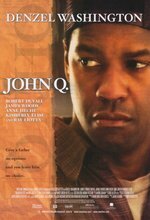 Denzel Washington features in this moralistic parable for our economically-challenging times as John Q. Archibald, a factory worker struggling with reduced hours at work and smaller paychecks attempting to secure a heart transplant for young son Michael when he collapses during a baseball game. Determination turns to desperation when the Archibald family's insurer refuses to cover the costs of an emergency heart transplant, leading John to take matters into his own hands as he holds an entire hospital full of staff and patients hostage at gunpoint until a procedure can be arranged. Keram Malicki-Sanchez ... Freddy B.